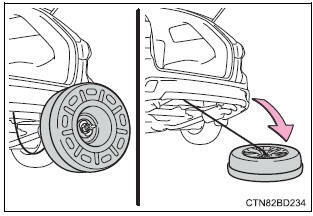 Stand the tire against the bumper with the inner surface facing toward you and install the outside spare tire cover. Pass the hoist assembly (c) and holding bracket (b) through the wheel opening. 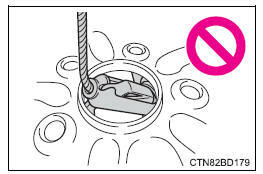 When stowing the tire, make sure that the hoist assembly is placed perpendicular to the wheel opening. 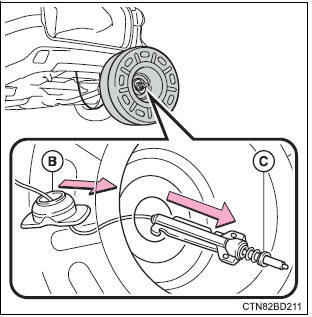 Using the jack handle and adapter socket, tighten the spare tire clamp bolt by turning it clockwise until the tire is in the correct position and two clicks are heard as the jack handle skips. Install the inside spare tire cover to the outside spare tire cover. The compact spare tire is identified by the label "temporary use only" on the tire sidewall. Use the compact spare tire temporarily, and only in an emergency. Make sure to check the tire inflation pressure of the compact spare tire. 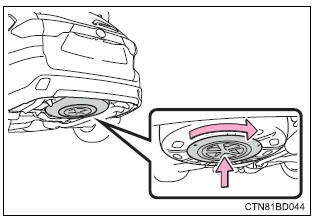 The vehicle is lower when the compact spare tire is installed compared to when standard tires are installed. As the compact spare tire is not equipped with a tire pressure warning valve and transmitter, low inflation pressure of the spare tire will not be indicated by the tire pressure warning system. Also, if you replace the compact spare tire after the tire pressure warning light comes on, the light remains on. 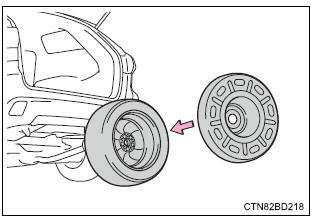 Perform the following steps and fit tire chains to the front tires: replace a rear tire with the compact spare tire. Remember that the compact spare tire provided is specifically designed for use with your vehicle. Do not use your compact spare tire on another vehicle. Do not use more than one compact spare tires simultaneously. Replace the compact spare tire with a standard tire as soon as possible. Before driving, make sure all the tools and jack are securely in place in their storage location to reduce the possibility of personal injury during a collision or sudden braking. Be careful when driving over bumps with the compact spare tire installed on the vehicle. 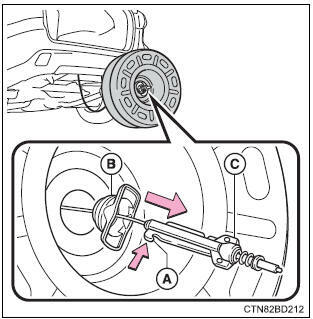 Securely tighten the spare tire clamp bolt to hold the spare wheel carrier by the hook. Stow the flat tire in the spare tire location. Failure to do so may cause damage to the spare tire carrier. Proper storage reduces the possibility of injury in a collision or during sudden braking. Have the flat tire repaired and the spare tire replaced with it as soon as possible. If the hoist assembly is slanted when stowing a tire, the hoist assembly may become stuck in the wheel opening and the tire may not be raised properly, causing damage to the wheel or the wire cable. 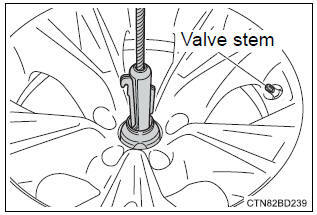 Do not attempt to turn the spare tire clamp bolt without a tire on the hoist assembly, as doing so may cause the wire cable to slip off of the shaft inside the unit and the wire cable may not be able to be raised or lowered. If the spare tire clamp bolt has been turned without a tire on the hoist assembly and the wire cable cannot be raised or lowered, contact your toyota dealer.